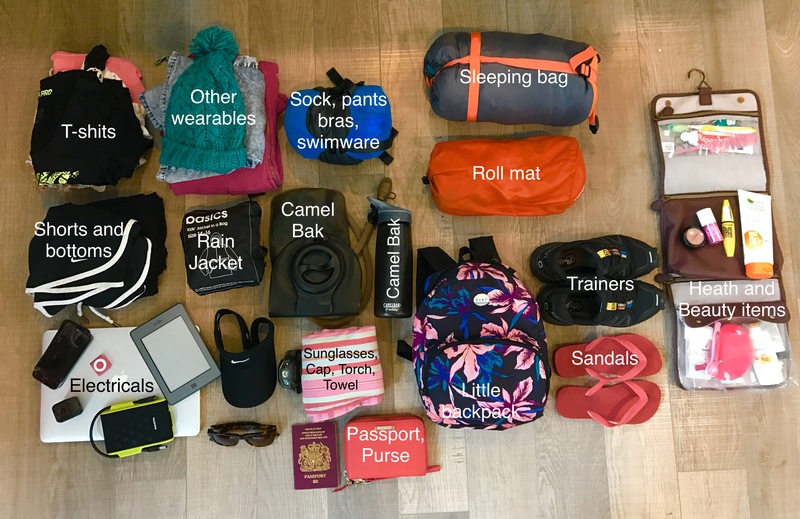 Your kit list can make or break your trip so let’s do it right. Here’s some tried and testing advise and suggestions. The aim is to pack small, light and only items that you use often. Everything needs to have more than one purpose or use. That can’t be the case for everything, but, it needs to be at the forefront of your mind when packing. Health and beauty items: Toothbrush, Toothpaste, Roll on deodorant, Sun cream, razor, shaving cream (smaller than shaving foam), wax and shower gel. Other wearable’s: Sunglasses, Baseball Cap, Beanie, a waterproof digital watch, a cheap waterproof jacket and a fleece. Health and beauty items: Shampoo, Conditioner, Shower Gel, Mini Shaving Gel, Razor, Nail Scissors, Tweezers, sun cream, Roll-on Deodorant, Mini Moisturiser, Chap Stick, Travel Floss, Toothpaste ,Tooth Brush, Small Hairbrush, a couple Hair Ties/ Grips, a few Cotton Buds, The Pill (or lady-time bits) and a small Insect Repellant Stick. Jewellery: I only have jewellery that I never take off, a pair of earrings, a necklace and my engagement ring. Other wearable’s: I have a light cotton jumpsuit on me just incase we go out for dinner or to a bar. I also carry with me a beanie, cap, sun-glasses, a thin waterproof jacket and a zip up hoodie. 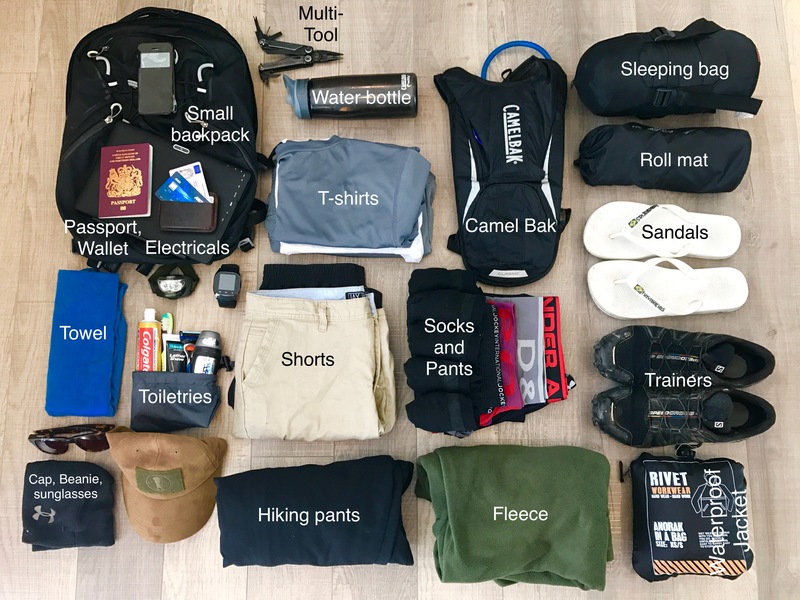 Small Backpack: we both carry a small backpack each for our money, drink bottles sun cream etc for when we head out for the day. Footwear: our backpacking footwear consists of two items. The first being a pair of sandals, a necessity for travelling during the summer. The second, are our Soloman Speedcross 4 trail trainers which are perfect for hikes. Compression Sacks: Treat yourself to a Compression Sack, these are cheap and will save you a lot of space. Jam all of your cloths in one, ratchet the straps down as tight as you can and there you have it, the same amount of cloths in half the space. We both use a medium sized one for all of our clothes and a small one for underwear/ socks. Towels: we both carry Kathmandu Microfibre Travel Towels. They compact down to nothing, are lightweight, and dry super quick. Thermals: one top (short sleeve) and one bottom we recommend merino. These are your insurance policy when it comes to clothing – you won’t use them all that much, however, it’s better to be safe than sorry. Sleeping gear: we use a Roman synthetic sleeping bag. It is rated down to +5 Degrees centigrade and it’s a good three seasons bag but it wouldn’t cut the mustard during the winter. Its the smallest we know of, when its crammed tight it’s about 15 Centimetres long. Electronics: we’ve got the following items between us, a laptop, phone, a Go Pro, kindle, Ipod, head torches, hard drive, and a portable power bank. A phone is essential and it doubles up as a camera which is great! The laptop on the other hand would not be unnecessary if we didn’t need it for work, we’d recommend using a tablet/ smart phone if you have the choice. Water Bottles. We have two each, both branded Camel Bak. One is a Camel Bak (2 Litres) and the other is a 1 Litre Camel Bak water bottle. They are both high quality products that we use on a regular basis. TOP TIP: Be sure to only fill your pack to 70% of its capacity as you’ll acquire bits and bobs on your travels. Remember, in order to have a small pack and an enjoyable adventure you need to go minimalistic, small and light. Take only what you need and leave the rest at home, along with all of your worries.